As the first peer-reviewed undergraduate journal dedicated to international science scholarship, JYI engages students in research, publishing, and creative science communication while fostering a culture of personal and professional development. JYI draws its staff from around the world and maintains a network of experienced mentors who provide in-depth advice throughout the scientific writing and reviewing processes. We are committed to a scientific community that is open and accessible to all. The Journal of Young Investigators (JYI) was conceived in 1997 as a web journal to showcase undergraduate research. In addition to publishing work by undergraduates, JYI provides innovative, high-quality educational experiences for undergraduates. JYI recognizes that educational opportunities for many undergraduate science majors do not extend outside of the classroom. In the past decade, the situation has improved dramatically with the emerging popularity of research experiences for undergraduates. However, three of the most important parts of the scientific enterprise – the communication of ideas, peer review, and the publication process – are often left out of the undergraduate educational experience. The communication of ideas is an integral component of science and research training. If undergraduates are to become successful members of the scientific community, they must be fully prepared as communicators of science, be they eventual researchers, science writers, teachers, or policy-makers. JYI views communication within the scientific community and with the public as equally important; as such, our goal is to provide undergraduates with training in both technical and non-technical written communication. Science journalists in our News and Features Department are guided by Science Writing Mentors, professional writers who help students master the art of distilling technically complex discoveries into articles that are palatable to the general public. Daunting as this task may seem, it is key to the success of science. In addition, it is this work that provides for a scientifically literate public. Science news provides basic, functional information necessary for living in today’s world. Organizations like the National Science Foundation have recognized the ability of science journalism to influence public perceptions of science. The ability of scientists and science writers to clearly communicate the facts and implications of scientific breakthroughs often weighs heavily on the decisions made by public interest groups and governments. The scientific enterprise can be described from the point of view of information flow. JYI calls this the information life cycle, a concept diagrammed on the right. Information is created through original research and analysis. This first step is usually portrayed as the central pursuit of the scientific establishment, but it cannot result in cumulative scientific progress without the rest of the information life cycle. New ideas must be communicated effectively. 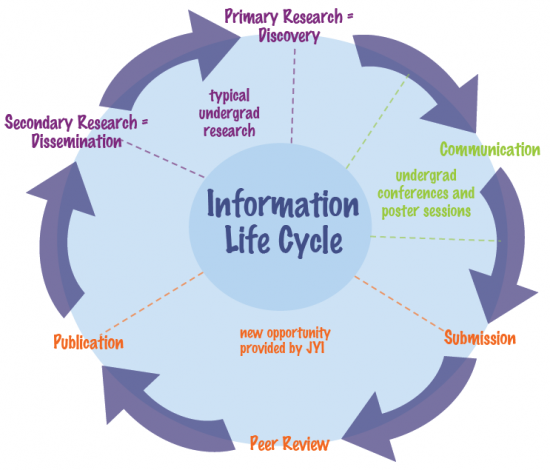 Today, research is largely disseminated through the traditional model of scientific publication, which includes the formulation of journal papers, peer review, and publication, followed by secondary research. These steps together form a continual cycle capable of driving scientific progress.